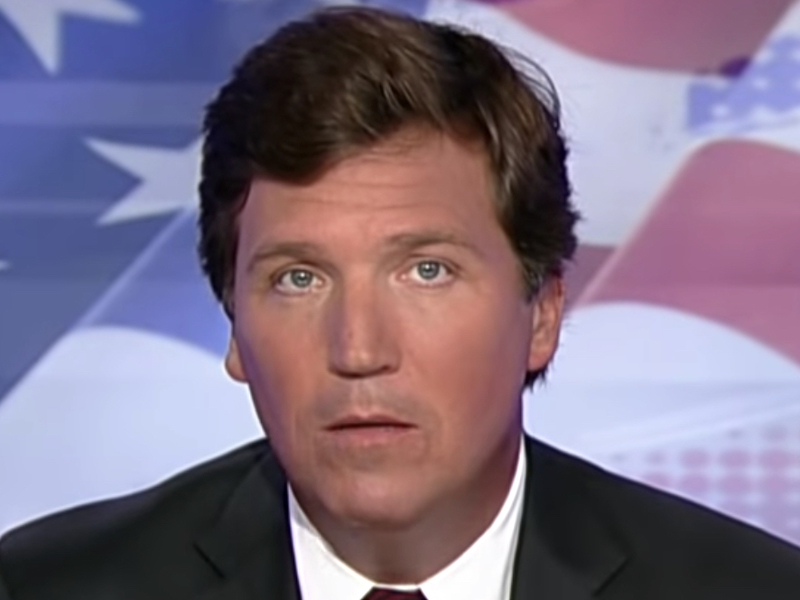 Tucker Carlson called for those who pushed the Trump-Russian collusion narrative if the report by special counsel Robert Mueller shows none in a monologue delivered on the Thursday broadcast of his FOX News show. MAXINE WATERS: There's more to being learned about it. I believe there has been collusion. NANCY PELOSI: We saw cold, hard evidence of the Trump campaign, the Trump family eagerly intending to collect possibly Russia. CARLSON: If you have any evidence at all of collusion, any, and I don't care how small it is, I will give the floor to you and I mean that. I want to wrap this up. CARLSON: Can you look at the camera and say I know the fact that Vladimir Putin was behind the hacks of John Podesta's email? CARLSON: Or John Podesta's email? SCHIFF: And I think that Ronald Reagan would be rolling over in his grave and you were carrying water for the Kremlin. MARGARET HOOVER: At what point you draw the line and not accuse the president of the United States without any evidence of being an agent of Russia? HOOVER: But betraying the country – by the way, we want evidence before you say, but you said an agent of Russia. HOOVER: But as a prosecutor that wouldn't be evidence in court. You know the difference between hard evidence and circumstantial evidence in the case of not hearing evidence that he is an agent of Russia. SWALWELL: I think it's pretty clear. It's almost hiding in plain sight. CHRIS MATTHEWS: McClatchy is reporting right now that Special Counsel Robert Mueller has evidence that Trump's personal lawyer and fixer Michael Cohen took a secret summer trip to Prague during the 2016 presidential campaign according to two sources familiar with the matter. Confirmation of the trip would confirm part of the Steele Dossier. JOHN BRENNAN: The reports that Mr. Cohen was in Prague despite his repeated denials. There is more and more indications that there is something here that is far from being anything at a witch hunt. Cohen: I've never been to Prague. Never been to the Czech Republic. Rep. Ralph Norman (R-SC): I had the balance of my time. Thanks for the history lesson: they hung him. Let's hang this guy. After a while, voters started to agree. Thanks to propaganda like this, 53 percent of registered voters now believe the Trump campaign quote "worked with Russia to influence the 2016 election." Among Democrats, fully 67 percent believe that Russia somehow rigged the vote tally. Nobody's ever explained how the Russians might have done that, but of course they did. Russia rigged the election. CNN says so every night. There is a need for this. Once the report appeared and it became incontrovertible that, whatever his faults, Donald Trump did not collude with the Russians, the many people who were persistently claimed on the basis of no evidence that he had with the Russians must be punished. Not indicted or imprisoned, but thoroughly shamed and forced to apologize. If the Republicans spent three full years falsely claiming that Barack Obama was included with the government of Iran, would those who claimed it ever work in politics or media again? That's a rhetorical question. Lying and recklessness should never be ignored. In 2003, the United States invaded Iraq on the premise that Saddam Hussein possessed massive stockpiles of chemical and biological weapons. Many of us thought it. But the claim was false. Thousands of Americans died. Trillions were wasted. Nobody was punished. To this day, Max Boot takes a paycheck from the Washington Post. Bill Kristol appears on MSNBC. John Bolton is this country's National Security Advisor. There were no consequences for their foolishness and dishonesty. None. And so we started a series of honorary similar wars, all with entirely predictable results. Nobody learned anything. Will we learn anything from the Russia collusion hoax? Or will the same cast of liars and buffoons simply move on to the next scam? “Climate Change! The Green New Deal! We can't give you details. It's too important. Obey or else! ”That could easily happen. In fact it will happen, for certain, unless we remember exactly what we've just seen.